Voices in Peril: Music of the Holocaust is a performance and lecture featuring Dr. Oeida M. Hatcher, dean of the School of Communication and the Arts, on Friday, January 20 at 7:30 p.m. in Sydnor Performance Hall, Elliot & Rosel Schewel Hall. The concert is free and open to the public. Adolf Hitler blamed the Jews not only for the economic crises following the 1929 Stock Market crash, but for the alleged degrading effects of contemporary art movements. The Jewish presence within Germany was declared a threat to the purity of the German State. When discussing the arts, Nazi leaders used the terms “Jewish” and “degenerate” interchangeably. Musical selections will include “March” from Symphonic Metamorphosis and “Sonata for Piano, Four Hands” by Paul Hindemith; “Grand March for Piano, Four Hands, Op. 45 No.2” by Ludwig van Beethoven; “Louange à l’Éternité de Jésus” from Quatuor pour la fin du temps by Olivier Messiaen; and Sonata da Camera for Flute by Marius Flothuis. 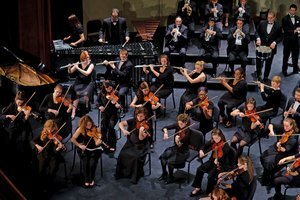 The University of Lynchburg Wind Symphony and Orchestra will perform along with Dr. Cynthia B. Ramsey, associate professor of music, Matthew D. Booth, ’11, piano; Teresa C. Angell ’11, cello; and Barbara J. Braun.